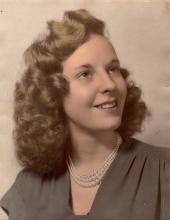 LANCASTER - Carolyn Rebecca Sears Crane passed away peacefully at The Morrison nursing home on Wednesday, March 13, 2019. She was 89 years old. Carolyn was the only child of Warren and Madelyn Sears, both of Lancaster, NH. She was born on January 28, 1930. She is survived by her husband, Donald E. Crane, also of Lancaster, to whom she was married for almost 70 years! Other family include her son, Kenneth Crane, his wife, Jay-Ann Crane, and her daughter, Jordan Crane. She was blessed with five grandchildren, Chad Crane and Erica (Crane) Hicks, Jay Belmore, Kaili Crane-Belmore and Tess Crane, and eight great-grandchildren, Griffin and Madison Crane, Tyler, Haile, Benjamin and Alexis Hicks, Kendyl Preston, and Mason Belmore. The Boson Red Sox have lost a devoted fan, who, for many years, kept score of every game on her homemade score sheets. Carolyn was something of an animal whisperer, nurturing dogs, cats, rabbits, guinea pigs, chickens, and even a rescued robin. She also had an amazing green thumb, and her home was filled with lush, healthy plants. Carolyn spent her final years afflicted with Alzheimer’s. In lieu of flowers, donations may be made to the Alzheimer’s Association. "Email Address" would like to share the life celebration of Carolyn Crane. Click on the "link" to go to share a favorite memory or leave a condolence message for the family.